“Breathing Fire” – Le Dragon de la Somme. 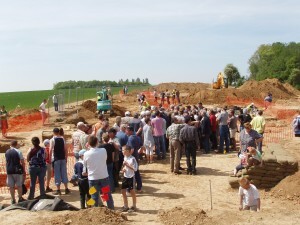 Upcoming exhibition at the Historial, Peronne from 16 June – 11 December 2011. Following the three week archaeological dig at Mametz last May I am pleased to report that a new exhibition is to open at the Historial, Peronne from 16 June 2011. Below is the text from the flyer that has been produced. If you are on the Somme from June – December then please do visit the Historial for the chance to see this exhibition. An exhibition that tells for the first time the story behind the Livens Large Gallery Flame Projector. Employed only ten times during the war – nine of which were on the Somme. The machine was 19 metres long, 40 centimetres wide, and weighed 2.5 tonnes. It was deployed from a tunnel beneath No Man’s Land by a specially-trained crew of seven, and fired a jet of flaming oil 100 metres long over the German trenches: the strangest, rarest and most horrifying weapon of the Great War. In May 2010 historians and archaeologists excavated a section of the British trenches near the village of Mametz in search of the remains of a Flame Projector believed to have been abandoned underground in late June 1916, just before the Battle of the Somme. The results were extraordinary, and for the first time for almost 100 years some of the original parts found in 2010 can be viewed alongside a specially-commissioned replica constructed by local students of vocational training centres. A special screening of the film “Breathing Fire – Le Dragon de la Somme” will be shown at the opening of the exhibition, 16 June at 6pm. A downloadable version of this flyer in pdf is available by clicking on the link below. Please feel free to disemminate this information to all your friends and battlefield visitors. It promises to be a terrific exhibition and for many will be the first chance to see parts of the Livens Flame Projector, buried in the Somme mud for 94 years. Exact date of transmission of the version for UK television still to be determined. I will post this when I find out the date from the production company. I use the tools supplied by WordPress and Google Analytics to follow how visitors reach my site. I am seeing a large number of visitors searching for details on the archaeological dig and accompanying television documentary programme that followed our search for any surviving pieces of a Livens Large Gallery Flame Projector at Mametz in May 2010. As the site was open to visitors and there was no ban on photos I don’t think it is breaking any great secret to reveal that we DID find pieces of this amazing weapon. It was 19 metres long, 40 centimetres wide and weighed 2.5 tonnes. Its specialised team of seven ensured it fired three ten second bursts of flame for up to 100 metres and, perhaps most remarkably, this was fired from a tunnel or ‘Russian Sap’ dug specially under No Man’s Land. At present (14 February) there is no broadcast date available for the UK or North American market. In the UK the programme will be broadcast as a Channel 4 Time Team Special. As soon as I know the broadcast date I will post the details so please check back or follow me on Twitter to be kept up to date. In the meantime, a couple of pictures. Update – 13 April 2011. The Projector site on a recce in September 2009. The old British front line runs through this shot. The village in the distance is Mametz. What a difference nine months makes - our open day at the site which was attended by hundreds. 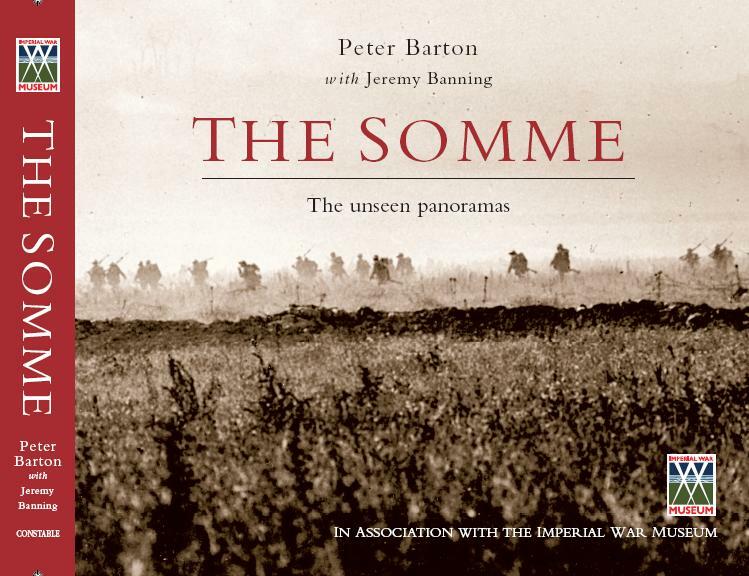 The revised and updated version of the 2006 Somme panorama book that I produced with Peter Barton is due out in the shops in February 2011. The official publication date is 24 February but I expect that copies will be available from the usual outlets a couple of weeks before then. The most obvious thing to note is that my name is on the cover this time and that the subtitle has changed from ‘a new panoramic perspective’ to ‘The unseen panoramas’. Other than that, text has been revised throughout and some pictures have been changed. There were elements of the 2006 version that we were not happy with and it is good that an opportunity has arisen to amend many of these parts. With every book you produce, there is inevitably a progression in the skills employed and understanding of what is required. I certainly found the Arras book easier to work on in the years 2008-10 than I did for the 2006 Somme version, but that is to be expected as in the intervening period we had produced the Passchendaele volume as well as my research on a couple of Richard van Emden’s books. Some images have been replaced and, most notably, we have included a section of one of the most remarkable panoramas of the war – a German panorama taken on 18 August 1916 from a spot near Grevillers showing High Wood and Martinpuich under British bombardment. The undamaged tree-lined Albert-Bapaume runs right across the image. 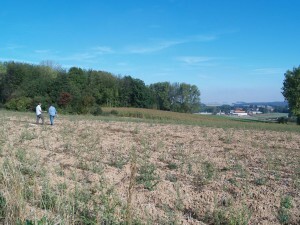 Many who have seen this panorama stand open mouthed – such is the effect of seeing what a Great War battlefield looked like. Probably the most relevant inclusion to spring 2011 is the revision and addition to the section concerning the use of the Livens Large Gallery Flame Projector. We have added incredible pictures of the weapon in testing at Wembley and some shots from our successful archaeological dig at Mametz in May 2010 showing elements of what we found from the machine. I have seen the first rough cut of the ‘Breathing Fire’ TV documentary for worldwide distribution and it is looking very good. A version for a Channel 4 Time Team Special will be cut for the UK market and broadcast in the spring (exact date to be confirmed). Should anyone have further questions about alterations to the book then please get in touch via the Contact page.